This is not advanced, does not belong here. Radio shack have a single temp/humidity gague which is identical to one sold by fungi.com (or was last time I checked). search, people have talked about this before. It doesn?t necessarily mean the hygrometer is not good just because it has a plastic casing. If I were you I?d buy an analog hygrometer with an calibration screw(cost 7-10$) and calibrate it according to the procedure found at the Grow/Find section. This will do a better job than many digital hygrometers. the electronics on the inside are reliable enough for your purposes. Staments and Ryche, to name a few, use the same one. remember- Life is not an exact science, miss by a bit and you will oft do far better than dead on target. Looking good. Have you calibrated them? Cheap hyrometers that are available at stores like Walmart, Kmart, Lowes and Home Depot are not made to operate at very high relative humidity (rH). Operating Range: 32? to 240?F. Accuracy: ?3% relative humidity, 25 to 95% range. 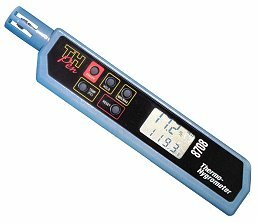 They also offer some other diffent hygrometers; these can get very expensive if you want very very accurate ones. When buying a hyrgometer you need to look at its specs. If the package does not offer its operating specs than it probibly is cheap and will not work. Here is another nice toy that I would love to have, but just don't have the money to blow. Here is where they sell it. You can probibly use a cheapy to get a good esitmate to see if you are approximately in the right area. Which is really all you need, but if you want something better for accurate measurements these two are the best out there unless you plan to spend 3-5 hundred dollars. Edited by Humidity on 09/27/01 09:52 AM. Yes, but I can't get them all calibrated right. Is there interest in a humidity / temperature controller? 2,502 topic views. 1 members, 4 guests and 0 web crawlers are browsing this forum.